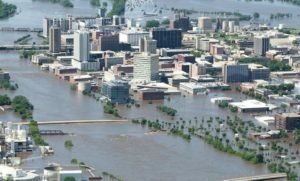 As the Cedar River crested on June 12, 2008, the City of Cedar Rapids was in a shock. Boats floated through streets where cars had been just a couple days before. We had just begun to experience the worst flood in our city’s history and were trying to figure out our next steps. For each of us that lived through the flood, our experiences in those days, weeks and months following the flood are forever cemented in our minds. Some lost everything. Others, like myself, were called upon to help hold the city together. The day following the crest, as the reality of the flood began to sink in, Chief Judge Remly and Sheriff Dennis Bloom called upon me, as the Director of the Sixth Judicial District, to prepare our facility to become an alternative county jail. My team was also asked to prepare to assume many of the court functions that needed to continue. Shortly after the first call, I was contacted by the National AmeriCorps VISTA Office to prepare to oversee 220 VISTA volunteers that were already on route to Cedar Rapids to assist in the aftermath of the flood. Over the weekend as we watched the water level begin to drop, I divided my command staff into two units to handle these two critical tasks. Within three days my team converted one of our residential facilities into an alternate county jail and begin accepting inmates. That same week, the VISTA volunteers began to arrive in Cedar Rapids. We welcomed them into temporary housing and set up a management structure and began to identify tasks to ensure each volunteer was able to contribute to our flood recovery efforts in a meaningful way. Over the following year, my dedicated team kept both critical tasks flowing smoothly as our city worked to recover from the flood. The memory cemented most in my mind from 2008 is the incredible community spirit that was present in each and every individual that assisted in the flood recovery efforts. Not one person on my team ever questioned the multitude of tasks heaped upon them without warning. They just did what needed to be done to help our friends and neighbors rebuild their lives. I am proud that I was able to be a part of such an incredible effort.